Will Events In Tunisia Be Repeated In Neighboring Nations? 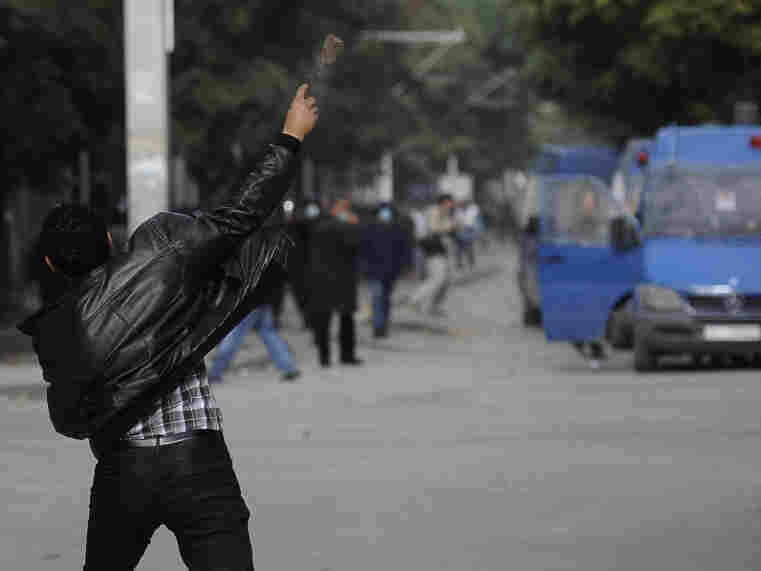 Analysts Doubt It : The Two-Way Even though the act that set off the protests in Tunisia -- a young man's self-immolation -- has been repeated in Egypt and some other nations, this morning's conventional wisdom seems to be that other governments won't collapse. A demonstrator throws a rock towards police during demonstrations in Tunis. Along with the news about what's been happening in Tunisia -- where protests in recent weeks were met with harsh, deadly force from authorities and ensuing outrage then helped force the president from power -- have come commentaries about the possibility that events there might encourage democracy activists across North Africa and the Middle East and topple other authoritarian governments. -- "Color me skeptical,' writes Stephen M. Walt at Foreign Policy magazine's website. "In fact, the history of world revolution suggests that this sort of revolutionary cascade is quite rare, and even when some sort of revolutionary contagion does take place, it happens pretty slowly and is often accompanied by overt foreign invasion." -- "Tunisia seems to have been a coup, not a revolution, although the coup might lead to genuine social change," says Sky News analyst Tim Marshall. -- "Tunisia, if anything, will have put the likes of Egypt, Jordan and Syria on heightened alert over the dangers posed by widespread economic grievances, making them more likely to act early to defuse such tensions," adds Tony Karon at Time's website.